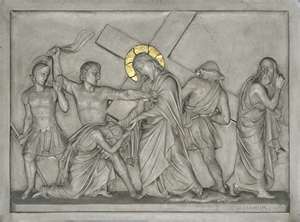 (Also called Stations of the Cross, Via Crucis, and Via Dolorosa). 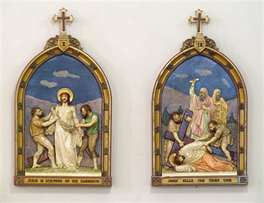 These names are used to signify either a series of pictures or tableaux representing certain scenes in the Passion of Christ, each corresponding to a particular incident, or the special form ofdevotion connected with such representations. 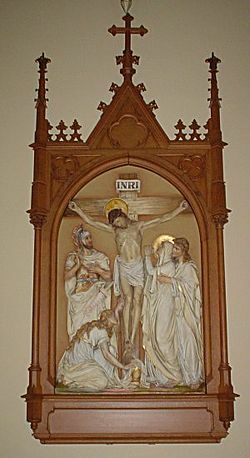 Inasmuch as the Way of the Cross, made in this way, constitutes a miniature pilgrimage to the holy places at Jerusalem, the origin of the devotion may be traced to the Holy Land. 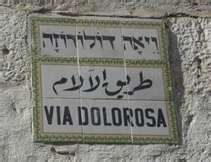 The Via Dolorosa at Jerusalem (though not called by that name before the sixteenth century) was reverently marked out from the earliest times and has been the goal of pious pilgrims ever since the days ofConstantine. Tradition asserts that the Blessed Virgin used to visit daily the scenes of Christ's Passion and St. Jerome speaks of the crowds of pilgrims from all countries who used to visit the holy places in his day. There is, however, no direct evidence as to theexistence of any set form of the devotion at that early date, and it is noteworthy that St. Sylvia (c. 380) says nothing about it in her "Peregrinatio ad loca sancta", although she describes minutely every other religious exercise that she saw practised there. A desire to reproduce the holy places in other lands, in order to satisfy the devotion of those who were hindered from making the actualpilgrimage, seems to have manifested itself at quite an early date. At the monastery of San Stefano at Bologna a group of connected chapels were constructed as early as the fifth century, by St. Petronius, Bishop of Bologna, which were intended to represent the more important shrines of Jerusalem, and in consequence, this monastery became familiarly known as "Hierusalem". These may perhaps be regarded as the germ from which the Stations afterwards developed, though it is tolerably certain that nothing that we have before about the fifteenth century can strictly be called a Way of the Cross in the modern sense. Several travellers, it is true, who visited the Holy Land during the twelfth, thirteenth, and fourteenth centuries, mention a "Via Sacra", i.e., a settled route along which pilgrims were conducted, but there is nothing in their accounts to identify this with the Via Crucis, as we understand it, including special stopping-places with indulgences attached, and such indulgenced Stations must, after all, be considered to be the true origin of the devotion as now practised. It cannot be said with any certainty when such indulgences began to be granted, but most probably they may be due to the Franciscans, to whom in 1342 the guardianship of the holy places was entrusted. Ferraris mentions the following as Stations to which indulgences were attached: the place where Christ met His BlessedMother, where He spoke to the women of Jerusalem, where He met Simon of Cyrene, where the soldiers cast lots for His garment, where He was nailed to the cross, Pilate's house, and the Holy Sepulchre. Analogous to this it may be mentioned that in 1520 Leo Xgranted an indulgence of a hundred days to each of a set of sculptured Stations, representing the Seven Dolours of Our Lady, in thecemetery of the Franciscan Friary at Antwerp, the devotion connected with them being a very popular one. The earliest use of the word Stations, as applied to the accustomed halting-places in the Via Sacra at Jerusalem, occurs in the narrative of an Englishpilgrim, William Wey, who visited the Holy Land in 1458 and again in 1462, and who describes the manner in which it was then usual to follow the footsteps of Christ in His sorrowful journey. It seems that up to that time it had been the general practice to commence at Mount Calvary, and proceeding thence, in the opposite direction to Christ, to work back to Pilate's house. By the early part of the sixteenth century, however, the more reasonable way of traversing the route, by beginning at Pilate's house and ending at Mount Calvary, had come to be regarded as more correct, and it became a special exercise of devotion complete in itself. During the fifteenth and sixteenth centuries several reproductions of the holy places were set up in different parts of Europe. 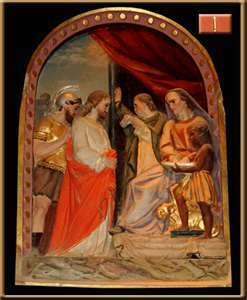 The BlessedAlvarez (d. 1420), on his return from the Holy Land, built a series of little chapels at the Dominican friary of Cordova, in which, after the pattern of separate Stations, were painted the principal scenes of the Passion. About the same time the Blessed Eustochia, apoor Clare, constructed a similar set of Stations in her convent at Messina. Others that may be enumerated were those at Görlitz, erected by G. Emmerich, about 1465, and at Nuremburg, by Ketzel, in 1468. Imitations of these were made at Louvain in 1505 byPeter Sterckx; at St. Getreu in Bamberg in 1507; at Fribourg and at Rhodes, about the same date, the two latter being in the commanderies of the Knights of Rhodes. 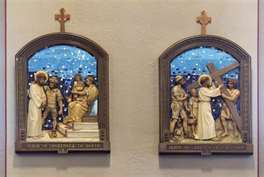 Those at Nuremburg, which were carved by Adam Krafft, as well as some of the others, consisted of seven Stations, popularly known as "the Seven Falls", because in each of them Christ was represented either as actually prostrate or as sinking under the weight of His cross. A famous set of Stations was set up in 1515 by Romanet Bofin at Romans inDauphine, in imitation of those at Fribourg, and a similar set was erected in 1491 at Varallo by the Franciscans there, whoseguardian, Blessed Bernardino Caimi, had been custodian of the holy places. In several of these early examples an attempt was made, not merely to duplicate the most hallowed spots of the original Via Dolorosa at Jerusalem, but also to reproduce the exact intervals between them, measured in paces, so that devout people might cover precisely the same distances as they would have done had they made the pilgrimage to the Holy Land itself. Boffin and some of the others visited Jerusalem for the express purpose of obtaining the exact measurements, but unfortunately, though each claimed to be correct, there is an extraordinary divergence between some of them.